the project was basically shelved due to the ending of World War II but the Soviet 'menace' was raising its head across the post-war world. Soviet Russia was developing more and more sinister looking weapons and the U.S. was in the inevitable race for dominance. 25th June 1950 - KOREA! The North Koreans invaded the South with devastating effect. They rolled back the South Korean forces capturing Seoul and moving towards the Port City of Pusan. The United Nations sought support from other nations to support South Korea with military Troops and Aid. The fast infusion of UN sanction help halted the North Korean advance and the UN were able to counter attack, drive North Korean Forces back northwards. The drive North by UN Forces brought the US Marines and others close to the Chinese Border this unnerved the Chinese who invaded, pushing UN Forces back south. This is serious - we need help! That the conflict in Korea will descend into another Iwo Jima or Saipan style battle with Korean Forces either having deep redoubts in hills and mountains or with mass banzai style attacks to overwhelm UN Forces. To this end, the U.S. Military decide they need a vehicle to dominate the battlefield in major actions against fortified positions. The Military Planners reinstate the T28 build program with some noticeable changes and re classifications. M28 is the T28 re-designated for operational purposes with existing configuration as built and although the engine leaves the vehicle underpowered is can enter limited service immediately. M28-A1 is the T28 re-manufactured using 2 standard M4A3 Ford GAF V-8 Gasoline Engines mounted transverse, Improved Transmisson and the wider T80 23" track with common elements of running gear to accommodate this option. This slightly alters the base outline of the vehicle and increases the ground speed of the vehicle from 13kph (8mph) to 22 kph (14mph) and the all-up weight from 95 to 105 short tons. M28-A1S The twin V8 arrangement in the M28-A1 proved only to be a short term option with the introduction of a Ford GAC V-12 770hp liquid cooled engine and when supercharged developed just under 1200hp. This however forced the restructuring of the upper engine deck and rear hull plate to allow for the larger engine, a 4-stroke auxiliary engine (to provide electrical power to the turrets, radio and gunnery systems) whilst the main engine was switched off, and to power the super-charger for the V-12 increasing the ground speed to 30kph (18mph). This revised engine bay arrangement allowed for the inclusion of the General Motors CD-850-1 cross-drive transmission in addition to a 100 gallon auxiliary fuel tank increasing the operational range from 160 km (100mi) to 200km (125mi). M28-A2 is the M28-A1S further upgraded with auxiliary turrets (T48-E1 see below) for close protection against mass, or swarm attacks to provide additional close-in protection - this increases the crew from 4 to 5 with the extra turret. A further upgrade is the provision of munitions dis-chargers mounted around the vehicle. These can fire a selection of Smoke, Anti-Personnel, Signal and White-Phosphorus Cannisters - the firing of the dis-chargers is controlled separately by the left or right auxiliary turret operators. 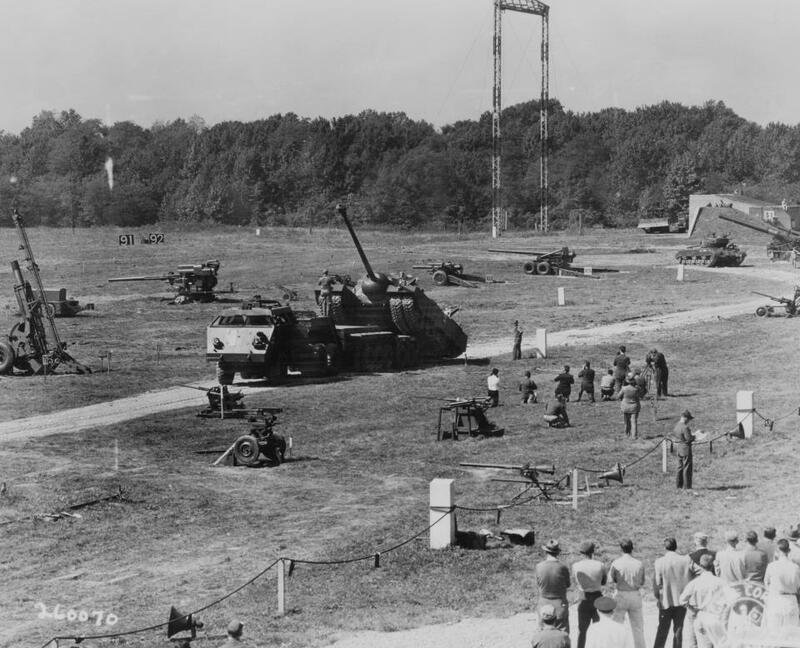 T48-E1 Auxilliary Turret - originally designed to fit the M48 Main Battle Tank coming in service with U.S Forces in Europe was modified for increased gun depression by means of an adapter ring and utilized on the M28-A2 as a quick expedient due to the time constraints involved. 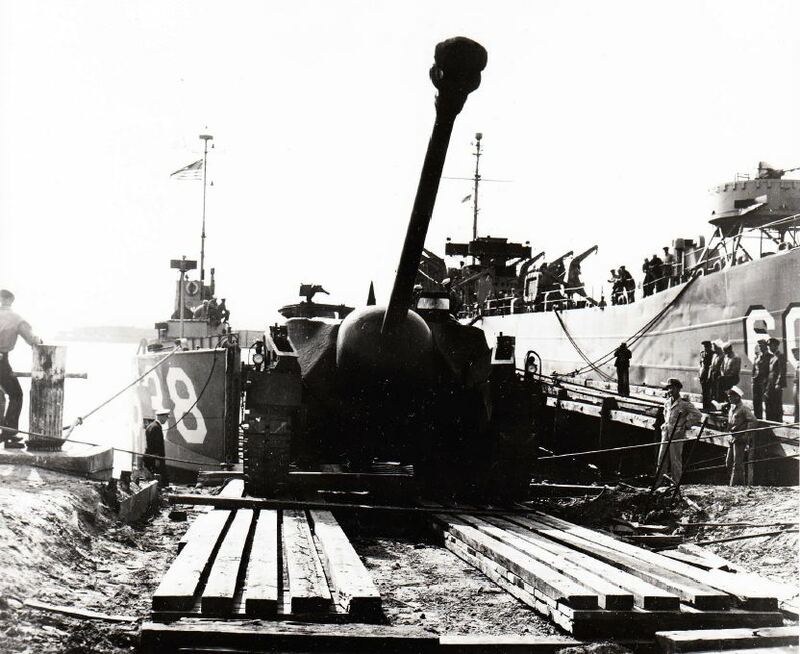 The M28 first arrives in Pusan, Korea in March 1951 following a period of rapid development and deployment. At this time only 4 vehicles exist [2 each of the M28-A1 and A2 types]. The initial M28 is retained stateside for crew training. Moving each M28 requires two M26 Dragon Wagons tractor units in tandem with a specially modified trailer when moving the main vehicle and a further unit for the extra track sections. 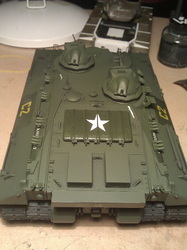 Further support comes with air cover and long-range artillery. These form a battle-group similar to that used by the navy to protect aircraft carriers. 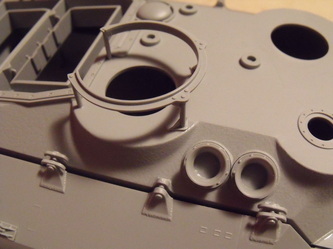 Raised fillets are made using 1.5mm thick plastic card to accommodate the new turrets. 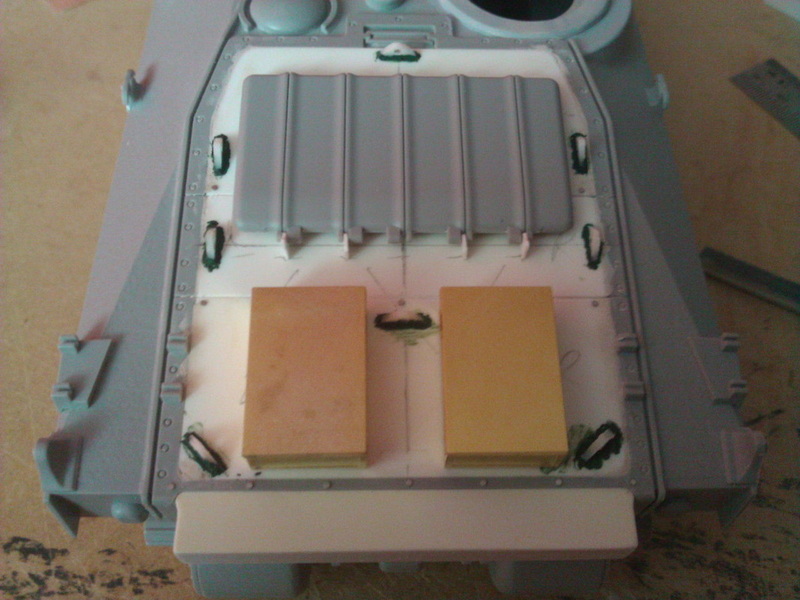 These will allow for the vision ports on the turrets to view down the side of the hull. The mg mounts will also clear the searchlight fitting (to be fitted). 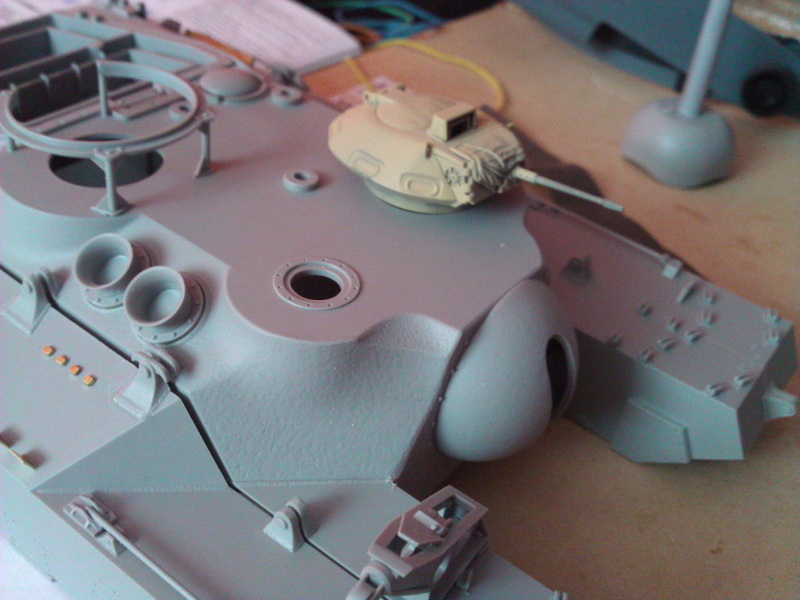 The holes are noticeably larger at 24mm inner diameter and 32mm outer diameter (matching the turret base). The fillets get a coat of Mr Surfacer 1000 to create the right detail and fill any voids once the glue has hardened. 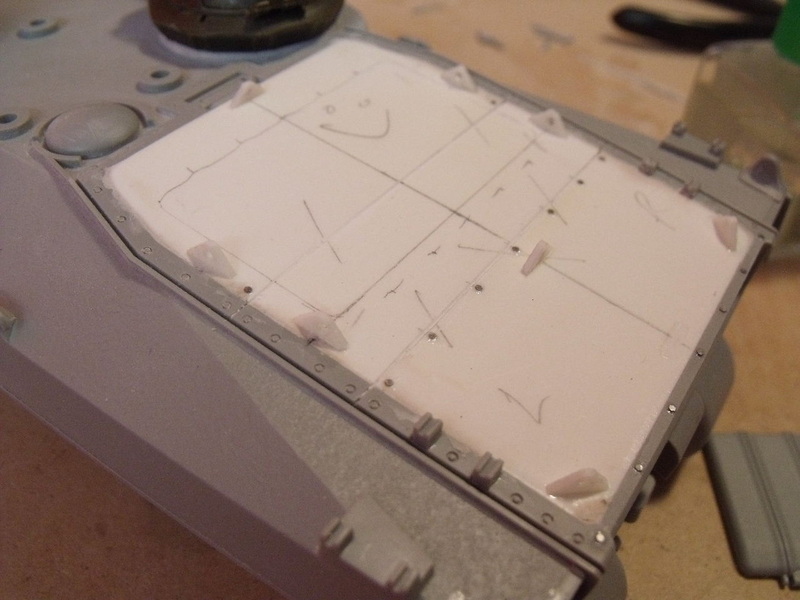 I realised that, with the forward turret replacing the Drivers position we had a dilemma, so I have made further modifications. The central raised aerial mount has been removed and the resulting hole filled and sanded which allows the forward turret ring to be moved back 3mm and inboard by 1mm. 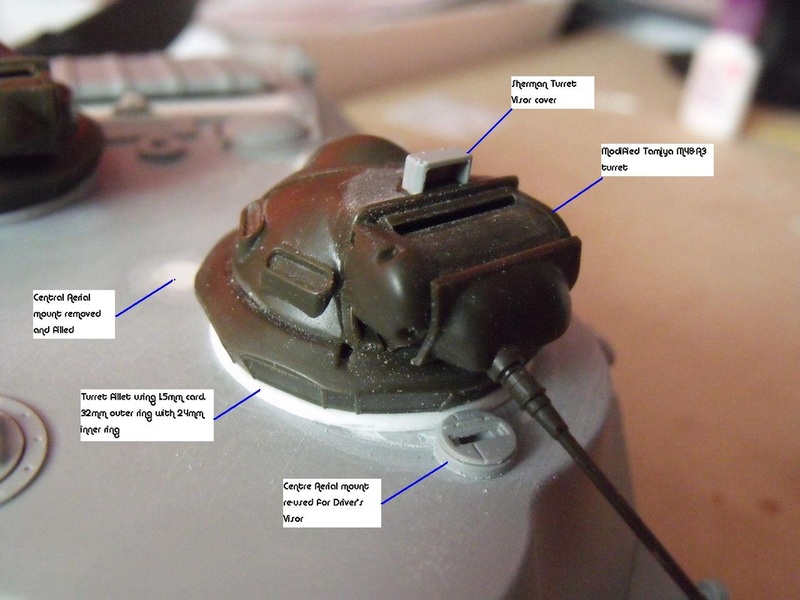 This allows for a Sherman turret vision port to be added forward of the turret to re-acquire the Drivers position min mounting the cut off aerial mount with redundant part B42 sanded down to fit with B33 (block cover) and C01 (vision block). 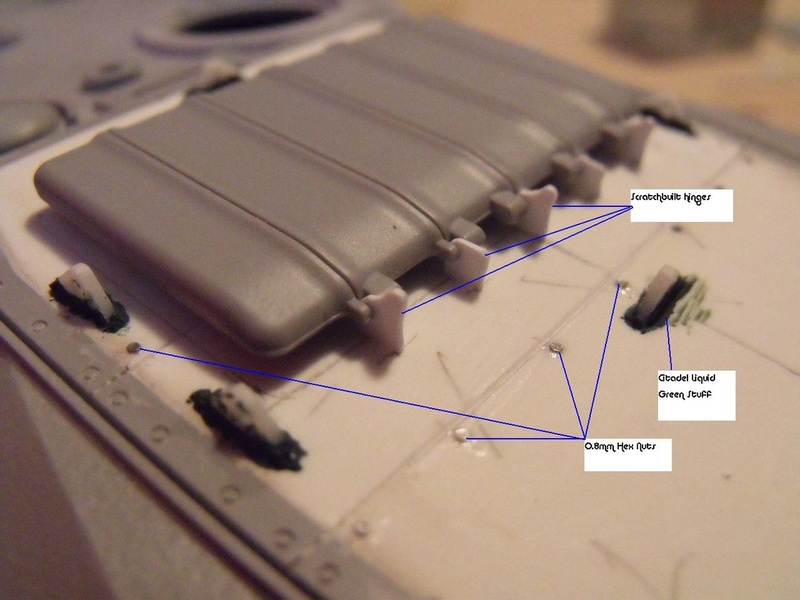 The revised engine deck comes in 3 parts in line with the main casting - a central section with stress spine, upper plate (engine cover) and lower plate (transmission cover). I used 1.5mm sheet plastic for the new deck, Tamiya 5mm traingle rod for the lift eyes and Lionmark 0.8mm PE Hex nuts for the bolt heads. in order to allow sufficient airflow to the engine the venting system was revised with veins to direct the flow. I used Evergreen 6mm x 15thou strip for the grills and Slaters 1mm square rod for the brace bar. 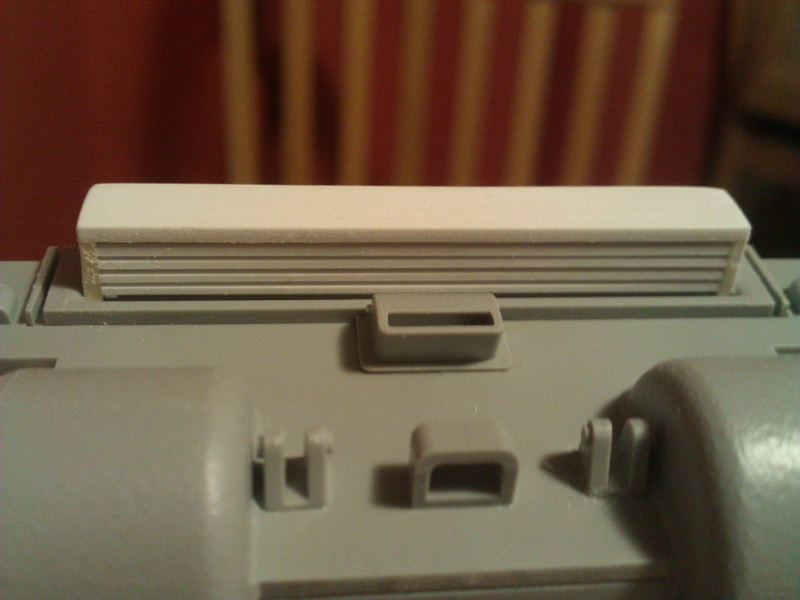 Hinges for the raised vent as well as stops are incorporated for the raised vent hood. Heavy duty lifting eyes are also welded to the deck plates. Welds on the lifting eyes are represented by using (Games Workshop) Citadel Technical, Liquid Green Stuff an extremely fine filler paste. 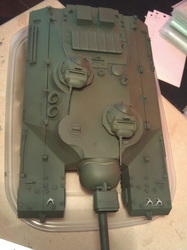 With such a large engine deck cover the 'real' vehicle would need an outlet for the air venting around the engine bay. So I built one using 1.5mm x 7mm strip stock. 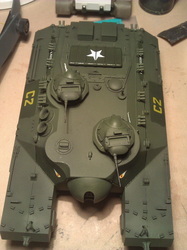 The box was fitted in the recess on the upper rear hull. I cut 2 pieces 6.5mm long and 1 piece 60mm. this was then topped with 0.5mm card stock. 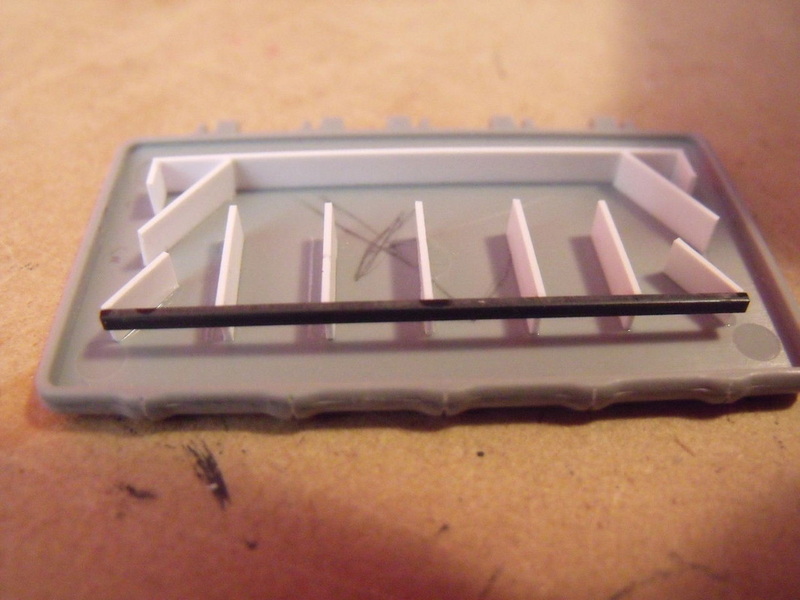 Underneath for the grille I used 0.75mm x 1.0mm Evergreen (132). Cutting 4 lengths and spacing them evenly I braced them with a cross-member and secured them to the underside. 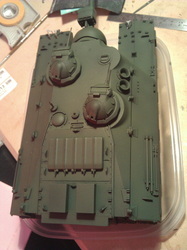 Whilst the engine deck looks the part it needed something more. Tool and equipment stowage is an important feature on any vehicle so. 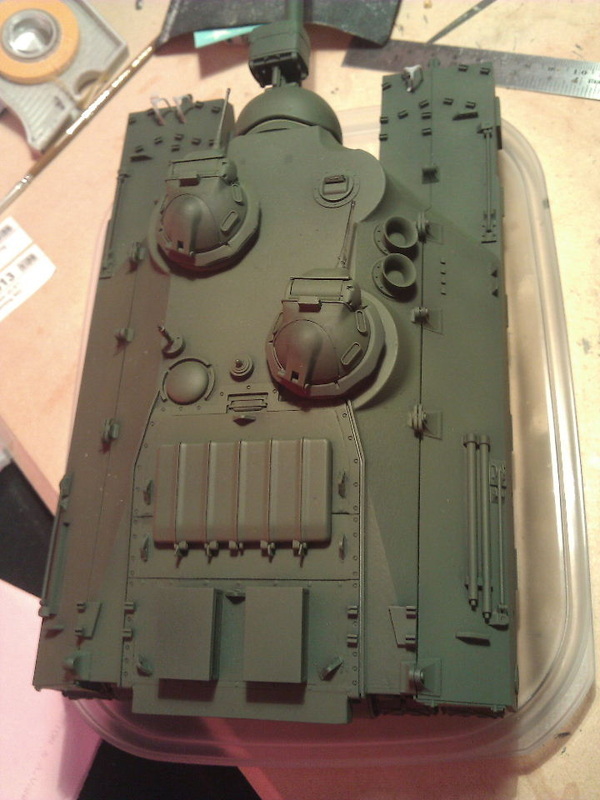 The T28 kit comes with 2 PE stowage boxes normally fitted to the right sponson but I have relocated them to the rear deck panel taking care to position them so as not to impede any maintenance issues. Looks better too! 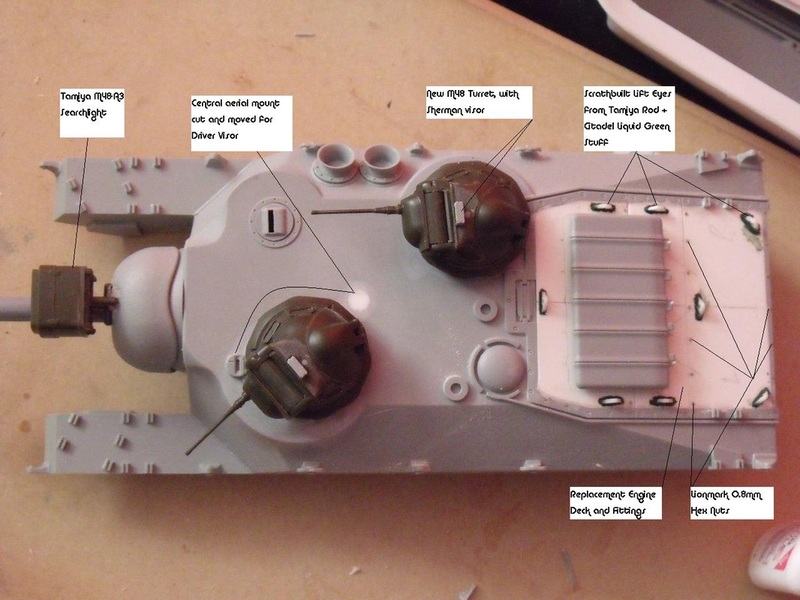 Which turret, if any, to put onto the 'new' version of the T28 - needless to say I chose Option 3 but you can see here my choices. 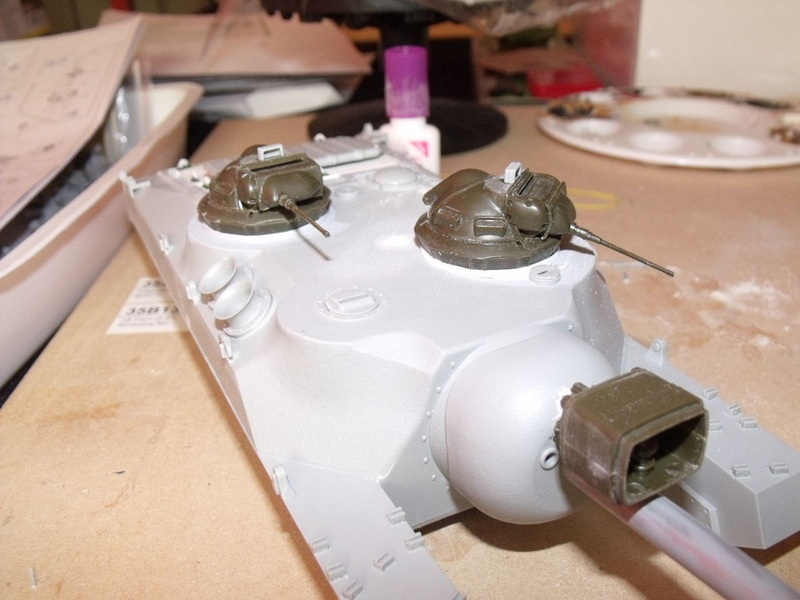 Now, in order to get the M48 turrets to fit this scenario it was necessary to modify the original kit part. The base (D36) is seen here raised up as the hole in the hull top isn't large enough. 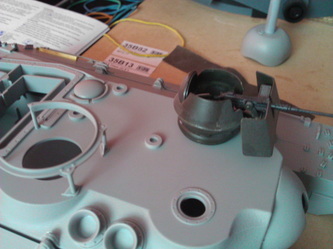 The mg mount is cut from the upper turret (D24) and approx 1mm removed from the bottom section. 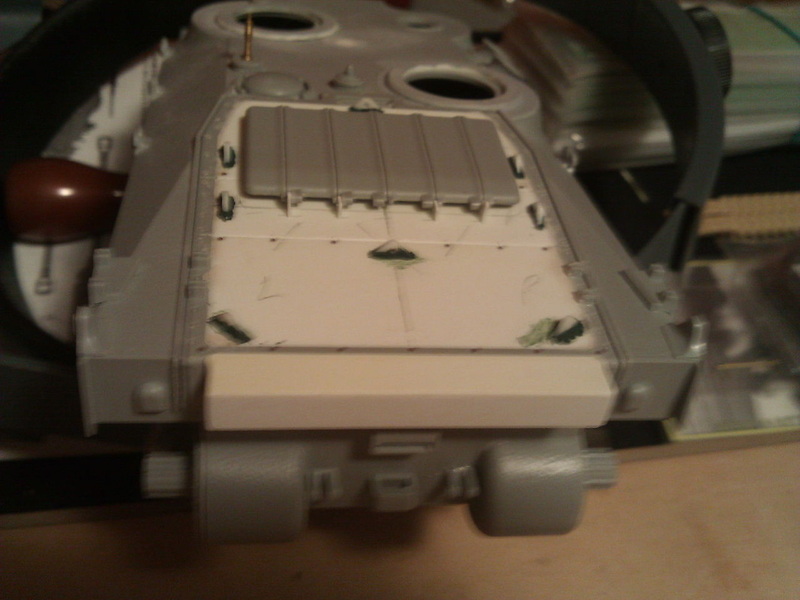 The ridge on the mid section (D25) is removed and so is the wide part of the bottom of the gun mantlet (D35). This allows for an increased depression of the gun to fulfil the close protection required - see above.The turrets from the M48 kit, I used some Tamiya one's I acquired recently, the modifications to each turret took about 20 minutes and isn't at all hard. Just a razor-saw, a file, side-cutters and glue. 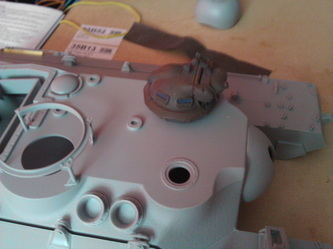 The turret bases are then sanded down so that they 'just' fit the fillets and there you have it. Plus, I used a redundant part B44 to create the periscope - shown here in grey. Sneak up, light up and shoot-em up! Having the turrets off-set will allow for the vehicle crew to provide mutual support fire. As you can see, the gun depression allows for close protection of the vehicle. It also gives all-round vision to the gunner. The addition of the searchlight was an afterthought but I think it makes a lot of sense especially, as this is a bunker-buster. As you can see, this is pretty much how it will look. 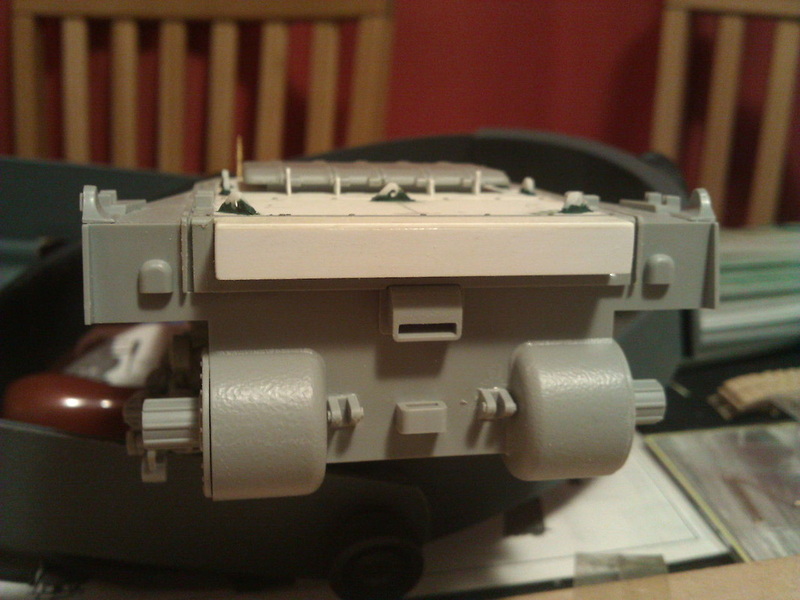 However, the searchlight mount just needs the fixings and power cable. 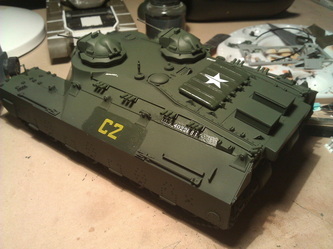 Taking a bit longer than I thought this adhoc build still holds my interest and in figuring out which part to do next. I am outside of my comfort zone on this project but enjoying it immensely. 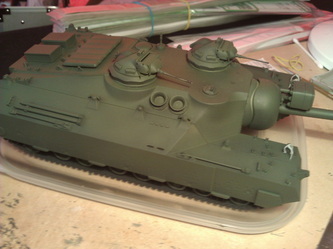 A final coat of Vallejo US Dark Green covers this beast ready for final elements. This model needed a little something extra and so, I thought, an anti-personnel device. I prefabricated a large number of dischargers from plastic card and tube and fashioned them into these launcher units. 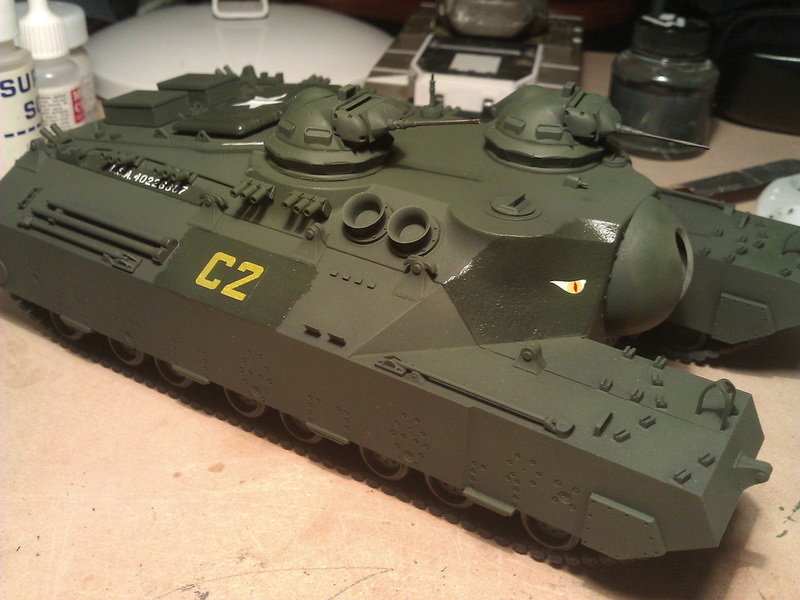 I recycled some old unused decals and applied sparingly to give some depth to this beast without overdoing it. 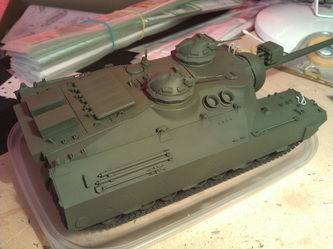 I shall be taking this model with me to Duxford on Sunday 16th June at whatever stage it is.